Akshara Haasan is said to have signed a web series which will be based on the book Good Bye Girl and is prepping up for her role in it. The most celebrated actor of Tamil cinema, Kamal Haasan, has always maintained his fitness levels and even at 62, he looks fitter and no signs of aging. Kamal Haasan has always made it a point to workout and maintain his physique which he believes is his investment in the art form. And joining him is his younger daughter Akshara Haasan who is set to get into some fitness sessions. 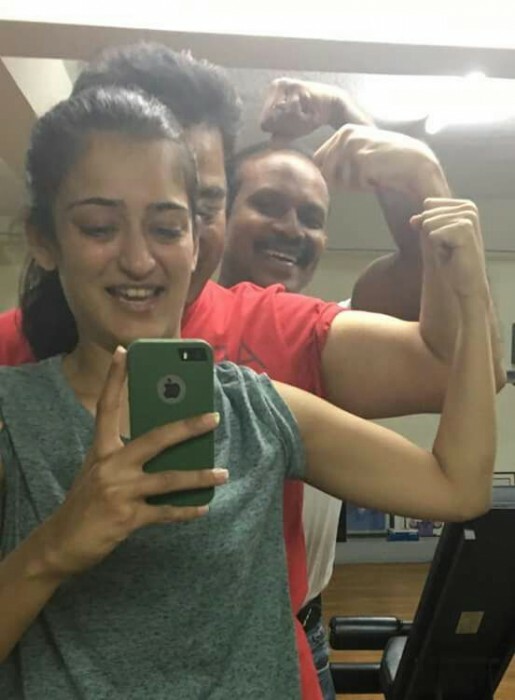 Kamal Haasan posted a picture on his social networking page which has him and daughter Akshara posing with their biceps after a grilling session of workout. “Gyming with my babe. With muscle man Suri. Way to go baby work your body. it WIIL work your mind better. A strong body abilitates a stronger mind,” wrote Kamal Haasan on his Twitter handle which also had a message for his daughter Akshara. Akshara Haasan is said to have signed a web series which will be based on the book Good Bye Girl. The web series will be directed by Aditya Dutt and will be about a young woman who is on a journey seeking justice. It is being said that the web series would have some action sequences as well and will require Akshara to up her fitness levels, and hence she chose the best possible mentor – father Kamal Haasan. More details about the web series are yet to be revealed by the makers and soon an announcement is expected. #Vivegam Actress @aksharahaasan1 signs a new web-series.. It will be an adaptation of the book #GoodByeGirl, about an 18-year-old girl’s quest for justice..
On the other hand, Kamal Haasan is busy with his political journey which he embarked on recently. Kamal Haasan has been visiting places which need attention from politics perspective and has been vocal about the issues in the state of Tamil Nadu. Kamal is also gearing up to start shooting for Indian 2 which is expected to go on floors soon and will be directed by Shankar. The ONLY person giving fitness goals in this picture is the guy behind those two. Why would any one have a “goal” to be as fit as Kamal Hasaan or Akshara? That can be an intermediate stage pursuing your fitness goal but definitely not a fitness goal in itself.